This book provides a comprehensive and systematic analysis of the various schools of Qur'anic exegesis, from the earliest periods through to the present day. 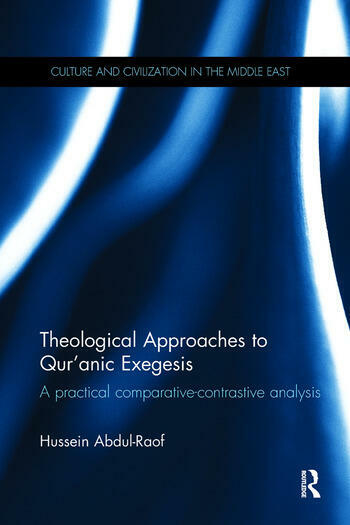 Employing a comparative-contrastive methodology, the author examines traditional and rational schools of thought – such as the Mu’tazili, Shi’i, Ibadi, Sufi, metaphysical, modern, and scientific approaches to the interpretation of the Qur’an – to give a detailed analysis of the similarities and differences in their theological views. The study spans a broad period, covering exegetical techniques adopted in Qur’anic exegesis from its infancy during the 1st/7th century up to the beginning of the 15th/21st century. Furnished with copious micro- and macro-level examples which explicate the Qur’anic notions and the points of view relevant to each school and exegetical approach, the book provides a rounded empirical study of Islamic thought. This thorough and holistic historical investigation is an important contribution to the study of Qur’anic exegesis and Islamic theology, and as such will be of enormous interest to scholars of religion, philosophy and Islamic studies. Hussein Abdul-Raof is a Professor of Linguistics in the Faculty of Arts, University of Taibah, Saudi Arabia. His research interests lie in Arabic and Qur’anic linguistics and rhetoric, Qur’anic studies and Qur’anic textual analysis.